I am deeply saddened by the events of last Friday in Christchurch. One evil individual has hurt so many and spoilt our country forever by his cowardly act. Regardless of race, creed or religion, this is not how we behave in New Zealand. We must all strive to ensure this never happens again. My thoughts go out to those in Christchurch and throughout the country who are suffering. 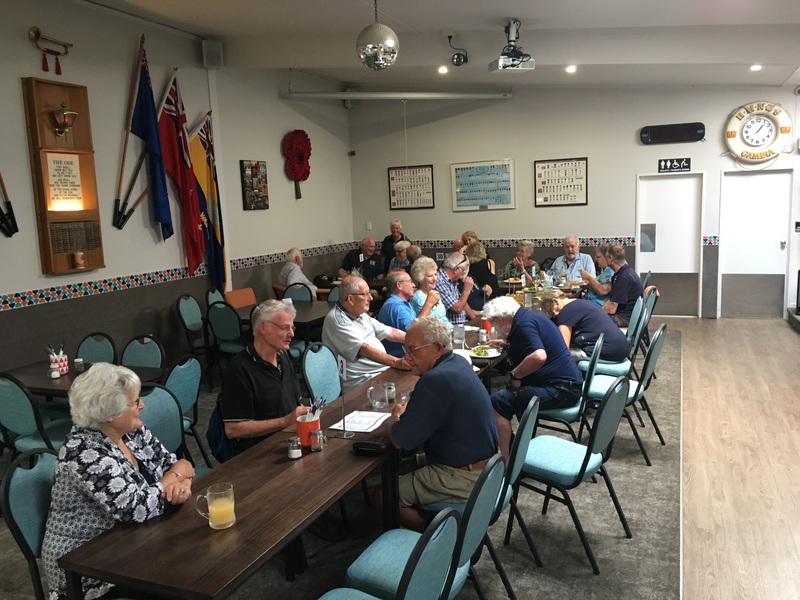 Our monthly lunch at the Waiheke RSA last week was well attended. The weather was good and so was the company, hospitality and food. Thanks to all who attended and especially to the Waiheke RSA staff and restaurant. Our next lunch will be at the Henderson RSA on Thursday 18 April. Yes, we have decided to hold it on Thursday due to Easter weekend. Last month Ken Smith (100267) joined the HMNZS Ngapona Assn. Welcome aboard Smudge. To all those other past members of Ngapona who receive the weekly newsletter, we encourage you to join the Assn. There is a once only joining fee of $40.00 with no annual subscription. 1 To foster and promote comradeship amongst former members of the RNZNVR and HMNZS Ngapona in particular, those having an association with, or an interest in, the RNZN and/or RNZNVR, and members of the Association. 2 To encourage an interest in the history of HMNZS Ngapona and maintain a permanent record. 3 To support HMNZS Ngapona if and when required. 4 To liaise and co-operate with other Divisions of the RNZNVR and the RNZN. 5 To encourage members of the Association. Your membership will help preserve the history of Ngapona. Sailors’ Reunions have now become “part & parcel” of our lives as we all realise that life is far too short and getting together is so important. To have a successful Reunion requires the dollar(s) $$ to assist with costs and help keep the cost to attendees down. In our particular case, with it being a unique, ‘one-off’ reunion of special significance we want it to be a total success. There are considerable costs involved with the Survivors of The Rock Reunion that are not normally encountered by other reunions: memorial plaque, boat hire, bus hire and venue hire (Ngataringa may no longer cater for over 100 people). We are therefore seeking sponsorship to help meet these costs and avoid the reunion being beyond the affordability of many ‘old salts’ who wish to attend. Consequently, if anyone knows of, has contacts with or links to sponsorship sources, or would like to make a personal donation, please contact either our Reunion Chairman, Gary Houghton, email address garydk@icloud.com or Reunion Treasurer Charlie Armstrong, email address charliearmstrong@xtra.co.nz. All sponsorship and donations will be appropriately acknowledged. Happy to announce that we have full sanctions and endorsements from CN, DoC and the RNZN Museum. The main focus of the reunion is to set in place a memorial plaque on Motuihe Island to say that we (the RNZN) were there. We will be very grateful for any financial assistance received. On 26 March 1976, the patrol craft HMNZS Taupo, commanded by Lieutenant Commander DB Herlihy RNZN, intercepted a foreign squid-fishing vessel off New Plymouth, working 1.8 miles inside New Zeeland’s 12-mile fishing limit. While Taupo attempted to arrest the fishing vessel it headed out to sea, with Taupo maintaining hot pursuit. The government ordered a P3 Orion and two A4 Skyhawks to be scrambled, and a burst of fire from a Skyhawk ahead of the fishing vessel brought it to a stop. It was then escorted back to New Plymouth. Click on image to enlarge. 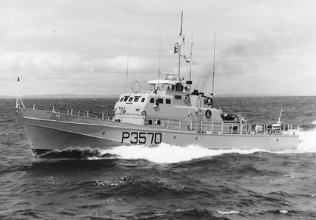 The RNZN in the early 1970s sought a replacement patrol craft for the slow and inadequate HDMLs which were of the Second World War era. These crafts would be used for fisheries patrols and surveillance of territorial waters which in 1975 was a 12-mile [19km] zone. They were not designed for patrolling the 200 mile [322km] EEZ that was declared from 1 October 1977. This was left to the RNZAF Orion and RNZN frigates. It was originally intended to order six vessels from Brooke Marine at Lowestoft in Britain but the order was reduced to four. Names were transferred over from four of the Loch-class frigates which had served with the RNZN in the 1950s & 1960s. The names chosen were Hawea, Pukaki, Rotoiti and Taupo. Taupo took up fisheries patrol work by mid-August 1975. This task would take up most of the deployment time by the patrol craft from 1975 to 1990 but they would also take part in RNZN fleet exercises with both RNZN and overseas vessels. The patrol craft was also used for RNZNVR exercises. During their initial service, the vessel was beset with vibration problems. This class of patrol craft had a reputation for being hard on their crews when underway in heavy seas and there were some sailors injured during the first deployments. One sailor who served on these vessels described them as capable of “rolling on wet grass”. During the service of Taupo, she would be in refit regularly while her sister ships were on deployment. In addition, the patrol craft was subject to fuel economy measures which meant for periods one of the patrol craft would be laid up at Philomel. All four craft were given extensive refits at Devonport from 1983 to 1985. To support the patrol craft a synchrolift docking facility was built on the South Yard of Philomel in 1973-1974. A 500 ton 40m concrete pontoon was fitted out as a base with stores and workshop facilities to service the patrol craft at the dockyard. Taupo served with the RNZN until 1990 when she and her sister ships were decommissioned and sold off.